Grubzon - A Gourmet Voyage: Yauatcha - Bandra Kurla Complex, Mumbai. This strange town was divided into four parts by the massive water canals formed by the falling seawater from above. The place usually traded in undersea products. I then spotted Nina running towards a local restaurant. Good girl. I was quite hungry too. Yauatcha is a Michelin starred dim sum teahouse in London. The brand also operates in Indian metros though we seem to be a few years away from the Michelin star system. That doesn't stop Yauatcha from being one of the best Chinese restaurants in India and probably the finest for steamed dumplings. Yauatcha is celebrating the annual Dragon boat festival till the 31st of June, 2016. 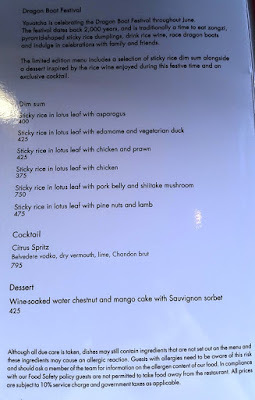 I was invited by the restaurant's PR to sample the event menu which included six Zongzi dumplings, a cocktail and a dessert. All of these items are exclusive to this event only. So hey, it was too attractive an event to not go to. Yauatcha like its sister concern Hakkasan uses modern Asian themes and elegant decor to provide a comforting environment. The crowd is much more refined as well and one can truly enjoy a good meal in peace. There are no pretentious Asian motifs and there is an air of elegance in the place. The place looks rather beautiful especially at night with the dim golden lighting. 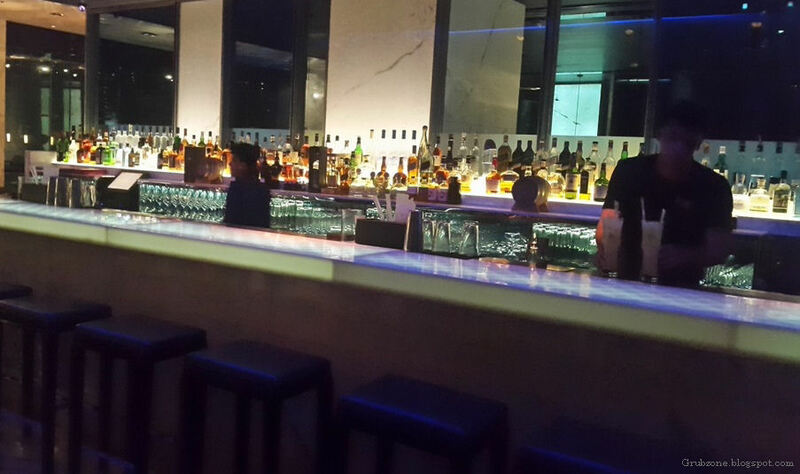 It somehow imparts a feeling of being in a resort restaurant rather than a place in the middle of maximum city. 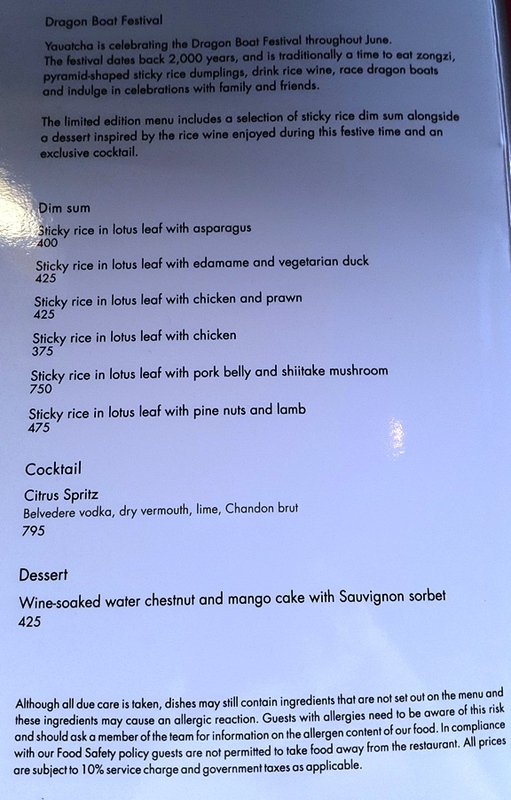 The Menu for the event. Citrus spritz was a well presented drink with a fizzy and citric flavor. 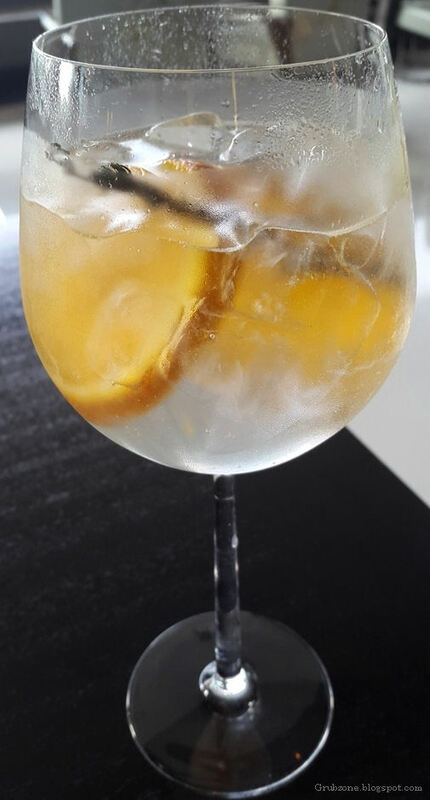 This was a mix made of Belvedere Vodka, dry Vermouth, Chandon brut and lime. It was highly potent but its potency was not immediately felt. Its effects felt stronger as time passed and this was a proper celebration cocktail. Next up were the Zongzi dumplings. These are conical shaped dumplings that originated from Northern China. The dumplings are usually wrapped with bamboo leaves and a variety of other leaves. Yauatcha used Lotus leaves. Different leaves endow different flavors and aromas on the dumplings. The dumplings had a bit of meat inside glutinous or sticky rice. 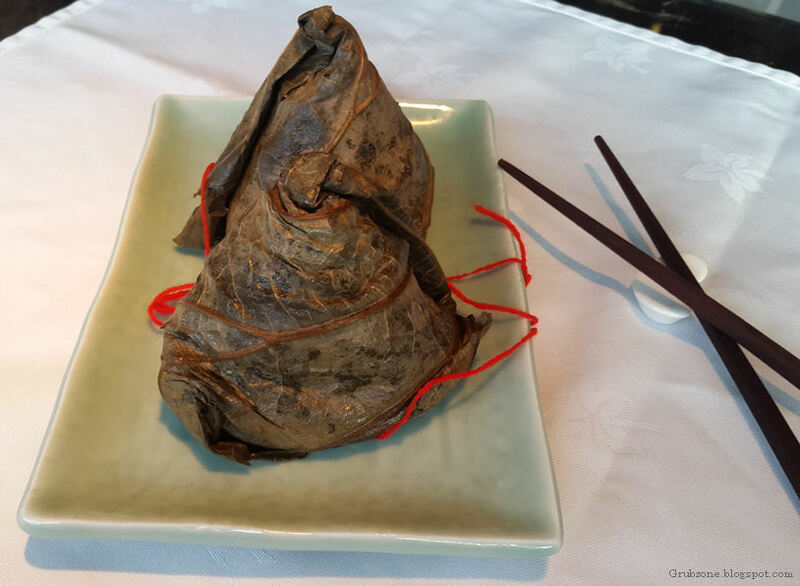 Wrapping Zongzi is a skill that is usually passed down in Chinese families. One can only imagine the training the chefs had to undergo before presenting Zongzi to their patrons. Though the dumplings had a northern shape but the fillings were savory which is more common in the southern parts of China. So one can say that in essence the dumplings represented all of China. Wrapped Zongzi - A perfect cone. All the dumplings essentially look the same so the only way to distinguish different flavors was the colored threads. This dumpling contains pork and its represented by the radiant red string. Opened Dumpling - The rice was sticky and savory. It sealed the freshness and the aromas of the dumpling inside. I managed to sample five of the six dumplings available on the menu. Edamame and Vegetarian duck dumpling. This contained faux duck meat made from soya which felt very close to the real thing. Yauatcha is well known for their vegetarian meats. The fine edamame complemented the faux meat well. It had a savory flavor with undertones of garden vegetables. 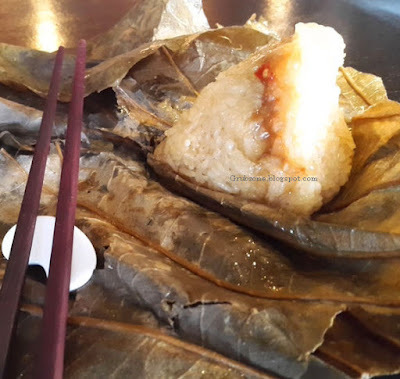 Chicken Dumpling - The classical chicken filling in a Zongzi shell was a new experience. I can say that sticky rice works better than batter cased dumplings. The flavor of the sticky rice and the chicken concert well together. Chicken and Prawn dumpling felt slightly disappointing as compared to the rest of the platter. The flavor felt a little weak for seafood but I suppose the primary problem with this dumpling were lower portions of meats as opposed to the rice. Pork Belly and Shiitake Mushroom was the best of the five that I tasted. It had succulent savory pork belly with a moderate amount of minced shiitake. The flavor was dominated by the pork. The flavor would really excite those who love savory food. I took seconds and thirds for this. Captain : Nina, would you like some pork ? Quartermaster : You never share food with us mate. Pine nuts and Lamb had a very flavorful filling. The lamb would just melt in the mouth, though this too had an issue with ratios between rice and the meat filling. Despite being made of rice, I think the dumplings felt light. One could easily have a full platter of six by themselves ha. The meal ended with Wine soaked water chestnut and Mango cake. 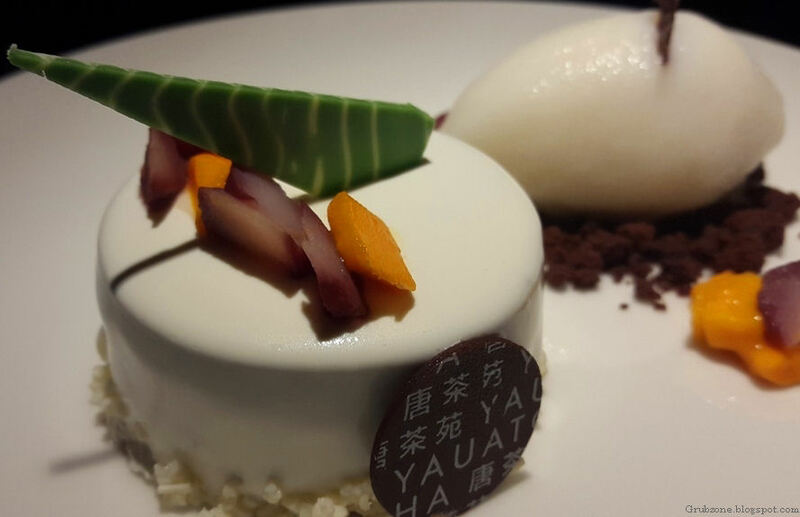 This was another one of Yauatcha's sweet masterpieces. It was served with a quenelle of frozen Sauvignon sorbet. The dessert had a unique flavor. The core of the cake was made of mousse like chocolate and mango bits whilst the exterior was made of a water chestnut flavored creamy shell. The sorbet and the cake came together to create an amazing alchemy. The dessert had a pleasant aroma and a great flavor. Shame it isn't available throughout the year. Captain : Grog flavored dessert? I like this. Quartermaster : So you can get high while you are high. Engineer : That sounds like a meme. Captain : What is a meme? Yauatcha had excellent service. The servers were professional, spoke good English and put up nice pleasant faces. They also accommodated the bloggers who were constantly moving food from one place to another. The pricing seems to be well suited for the deal. It is slightly on the higher side but one cannot find this food beyond 31st June in India. The chefs were specially trained and many of the the ingredients had to be flown in. 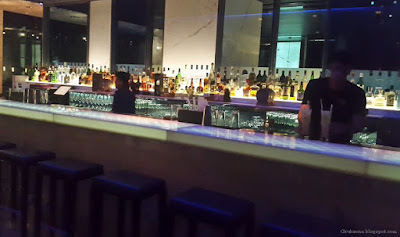 This was my first trip to Yauatcha and I really enjoyed the rare Asian niche that they cater too. 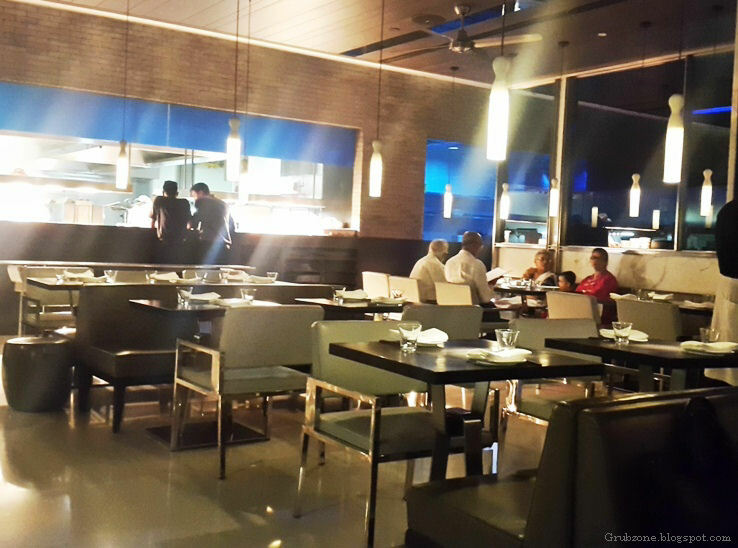 I think all elements fell in place and the restaurant is a worthy mark for all food lovers. I would certainly like to sample the grub they offer in their future events as well. Our meal done, we decided to further explore the place. With night falling in, the city's lighting system looked incredibly surreal. It was like a scene from a dream or a colorful comic. Who knew that such a place existed? Those rice dumplings look yum. I visited the one here in Bangalore. They have excellent spread!